Once again, the Highland County Board of Supervisors voted to fund local special interests at the expense of the taxpayer. At the January 23, 2002 Board meeting, the vote was unanimous to approve a resolution supporting federal tax “grants” for “renovations” at the old Monterey elementary school, now “The Highland Center.” The funding would be directed through ISTEA, the Intermodal Surface Transportation Enhancement Act, (now TEA-21) also referred to as TEP, Transportation Enhancement Program. Federal ISTEA program funds are routed through VDOT districts to local governments which act as “pass-through fiscal agents” for the grantee. In order for so-called “private, non-profit” organizations such as The Highland Center, The Chamber of Commerce or The Highland Historical Society, to dip into the public pork-barrel, the Highland Supervisors must vote their approval. The history of waste, theft and corruption found in federal pork projects, such as ISTEA/TEA-21, has been investigated and well-publicized, often to the amusement and scorn of taxpayers. But the funds don't come out of politicians' pockets. Public officials are addicted to pork-barrel vote buying, promising “next time” there won't be any waste or fraud— that the “program will be reformed” (by the tooth-fairy?). Additionally, there is virtually no oversight or accountability for the ISTEA/TEA-21 funding, especially at the local level. In fact, localities such as Highland County, acting as the “pass-through fiscal agents” for federal funds going to local “non-profit” entities, wash their hands of oversight. 25.660 acres of the historic River Field is now “preserved for future generations” by the LaPrade home and garage. Sitlingtons Hill, part of the “pristine battlefield”, is in the background. But there is a much more sinister aspect to federal “grants” to localities. The funding allows federal intrusion and micromanagement of local affairs, overrides local decision-making, and undermines the independence of localities by fostering a dangerous reliance on federal handouts. The federal “grant” to The Highland Center is but one of the pork-barrel projects approved by the current Board of Supervisors. The Highland County Chamber of Commerce, The Highland Historical Society and The Valley Conservation Council, a Staunton land trust, have received hundreds of thousands of taxpayer dollars over the past few years. The Supervisors seem to be obsessed with funding special-interest projects in Highland aimed at promoting tourism (especially tourism associated with the “McDowell Civil War Battlefield”) which benefit only a small but influential segment of the county's population. Many members of groups receiving pork benefits are directly involved in vocal opposition to all efforts to bring any kind of meaningful commercial or industrial development (private-sector employment) to Highland. They oppose meaningful improvements to the main east-west transportation artery, U.S. Route 250, a narrow, winding, two-lane mountain highway which provides access to Shenandoah Valley markets, and for agriculture, medical care, and jobs. They support measures, such as Scenic Byway designation for U.S. Route 250, which, along with support for “historic preservation” of the U.S. Rt.250 “corridor”, would almost certainly end any prospect for major road improvements and would restrict the rights of private property owners along the highway. A number of residents have observed that the hypocrisy of the Highland Supervisors is nowhere more evident than in their continual, unanimous approval of federal grants for special “tourism” interests while claiming to be in favor of road improvements and economic/industrial development opportunities in the county. Just as troubling is their deliberate failure to kill the Scenic Byway proposal. It was “tabled” for future consideration even when two of three supervisors adamantly opposed the measure. In the spring of 1999, George L. Hogshead offered a single, 53 acre tract of land for sale. The real estate firm of Clarkson and Wallace of Warm Springs advertised the McDowell tract as “under contract” in the April 16 issue of The Recorder, the newspaper serving Highland County. Highland County tax records for 1999 show the Hogshead tract as a single parcel, #58(A)17, 52.13 acres, appraised for tax purposes at $44,300. By Deed dated May 17, 1999 (Deed Book 113, Page 223), the HHS “purchased” two tracts of land from George and Kathy Hogshead. Attached to the Deed is a plat of survey by Elbert H. Rexrode, dated May 8, 1999, entitled Plat of a Division of Property of George L. Hogshead. By that Deed, at the time of the purchase by the HHS, the original Hogshead tract was divided into two tracts. Tract #1 is shown as 25.660 acres and Tract #2, which joins the Bull Pasture River, is shown as 25.766 acres, totaling 51.426 acres by the new survey. 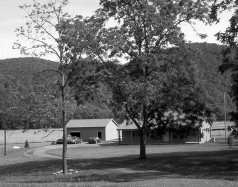 A June 18, 1999, article in The Recorder by Crysta Stephenson entitled “Society to preserve river field” stated, “The society has just purchased 25 acres of the Bullpasture River Field, located next to the Stonewall Ruritan Building, from George Hogshead of North Carolina.” There is no mention in the article of the missing 25 acres. The Recorder's news report, quoted above, is contrary to fact easily found in official county records and is considered purposely misleading by numerous county residents. The Deed was recorded on May 20, 1999, almost one month prior to the publication of The Recorder's article, allowing ample time to verify the facts. What happened to the missing 25 acres? The HHS Board of Directors adopted a Corporate Resolution on May 18, 1999, the day following the purchase of the “River Field.” In that Resolution, the Directors authorized the borrowing of $55,906.12 to purchase 51.32 acres (sic) for a price of $99,500, and further authorized the sale of 25.660 acres (Tract #1) to Lester and Laura LaPrade. On May 19, the HHS sold Tract #1 to the LaPrades for $45,000. All of the Deeds and documents were recorded in the Clerk's Office on May 20, 1999, but the LaPrade sale was not widely known at the time. In addition, an Agreement was entered into on May 19, between the HHS and the LaPrades granting a septic easement on the land retained by the HHS, suitable for a four bedroom home on the LaPrade land. The Agreement states certain conditions for granting the septic easement. Those conditions include cancellation of the septic easement if the “Historic River Field” were to be marketed for sale within two years, or if all or any portion of the land were sold within three years; and, the existence of an additional perk site on the HHS land. The intent of the Agreement appears to have been to leave the HHS land free of a septic easement encumbrance if funds could not be raised to keep the property as a “historical site”; to have the option to sell all or a part of the remaining 25 acre 'pristine battlefield site' for a home site; and/or to transfer all or a part of the land to another not-for-profit organization such as the Civil War Preservation Trust. According to The Recorder article, Diane Klein, the Chairman of the HHS, said the land would go back on the market if funds were not raised to pay the debt. The “historic” property was zoned light industrial and was considered by area residents as an ideal location for business or industry which could bring jobs into McDowell. During this period of time, many residents saw what they believed to be a hostile invasion of the county by outside forces bent on rewriting county history, preventing commercial or industrial development which would provide employment, and an underhanded attempt to transform a rural agriculture/ timbering based economy into a tourism-dominated economy for the benefit of newly-transplanted minority of special-interests. Highland's rural heritage and culture were under attack. The distinct possibility of increased restrictions on private property rights was seen as a real threat. Efforts were underway by the above groups to acquire additional land within the 3,000 acre “core” area of the battlefield with Department of Interior (National Park Service) and ISTEA funding; to restrict the rights of property owners with “conservation easements”; and, to railroad the village of McDowell into accepting the restrictions of a “Historic District.” This proposal was being pushed by Don Hower, Highland County's then representative to, and Trustee and Secretary of the Shenandoah Valley Battlefields National Historic District Commission. He was appointed by the radical former Clinton Secretary of Interior, Bruce Babbitt. It was also during that time a new “citizens group” named “HighRoad to Highland” was active in its efforts to scuttle major improvements to U.S. Route 250. The vast majority of Highland's residents—close to 90%— have supported major improvements to the east-west route which has seen little upgrading in several decades. The HighRoad group, made up of a dozen or two environmentalist activists and historic preservationists, combined forces with outside groups, such as the radical Southern Environmental Law Center, and Scenic America to pressure VDOT, the Commonwealth Transportation Board and the Highland Supervisors into canceling the proposed highway improvement plan. In June of 2000, the Highland County Chamber of Commerce, as part of a joint effort with the Valley Conservation Council to “protect the historic transportation corridors associated with the McDowell Civil War Battlefield…”, nominated U.S. Route 250 (the Old Staunton-Parkersburg Turnpike) as a Virginia Scenic Byway. The nomination by Chamber leadership was a collaboration with organizations whose primary goals appear to include promotion of tourism, more government controls on private property rights and an anti-growth, anti-road “green” bias. Another incident which fanned the flames of local resentment and derision was the construction of a $6,000 chestnut split-rail fence around the McDowell Presbyterian Church, replacing an existing chain-link fence. Funding for the rail fence was from a “grant” to the Highland Historical Society from the federally funded (National Park Service) Shenandoah Valley Battlefield Commission. The fence was, according to Paul Klein (husband of Diane Klein, Chairman of the HHS), approved “by members of the…Church and its ruling session.” The veracity of his statement has been disputed by numerous Church members. While the Church (c.1856) is a historic structure and was a focal point during the Battle of McDowell, knowledgeable area residents point out the lack of any historical documentation of a rail fence ever surrounding the Church. Mrs. Klein noted, “The fence draws attention to the area. It says, 'This is historic. '” The HHS claims the rail fence is “historically accurate.” In the same vein, she and other 'preservationists' continue to insist a mythical cannonball knocked a chunk out of the Church brickwork during the Battle of McDowell. There have been allegations the fence construction was simply a scheme to line the pockets of McDowell businessman Jim White, who has been very active in the HHS and presently serves as the Highland representative to the Shenandoah Valley Battlefield Foundation. We have not been able to determine if there is a factual basis for the allegations, since the HHS had not made any attempt to give the public an accounting of monies paid to Mr. White, if any, for his services for construction of the fence. HHS Chairman Diane Klein has refused our repeated written requests for a detailed accounting. Mrs. Klein referred us to the Battlefield Foundation which also refused to provide specific, detailed information about expenditures of public “grant” funds. Next on the list of highly questionable expenditures was the landscaping of the “green box/dumpster site” near the UDC monument along Rt. 250 just east of McDowell. This was another Chamber of Commerce/ McDowell Battlefield/ Parkersburg Pike project funded by federal ISTEA dollars. It was billed through Highland County by the Chamber in March and July, 2000. According to county records, Gobbler's Nob Nursery and Tree Farm submitted a statement (a summary of all expenses) for dumpster site landscaping of $6,754.00 which included a project cost over run of $1,130.00. Gobbler's Nob, owned and/or operated by Hower family members, was a member of the Chamber during 2000. County records indicate Gobbler's Nob was paid $5,624.00. While the “cost over run” was not paid, many residents believe the landscape costs were highly inflated. We were able to recently count 15 trees and shrubs planted which cost $894.00, approx. $60 each, 68 hours of backhoe/loader work @ $30/hr. ($2040.00), and a planter area formed of railroad ties approximately 6'x60'. Obviously, there are numerous questions begging answers. Readers can stop at the dumpster site to see the final 'work product' and come to their own conclusions about what kind of $5,624 “movement” it was. As a result of the above mentioned incidents (and many others, such as the construction of a $60,000 ISTEA “battlefield parking lot” strategically located so as to 'monkey-wrench' Rt. 250 road improvements), public opinion began turning against the “selfish” antics of a small inner circle of “preservationists” and “tourocrats” who, with the cooperation of a mesmerized Board of Supervisors and local press, were trying to “force themselves and their harebrained schemes” on the people of Highland, as one resident put it. Without doubt, many of the 15 member HHS Board and society members are unselfishly interested in the history of Highland and in preserving that rich history. Tom Atkeson, however, a HHS Board member from Monterey, submitted a bill for professional engineering services, paid by federal ISTEA dollars, for $363.46 in connection with the Chamber of Commerce/Highland Historical Society 'purchase' of the “Mansion House” in McDowell. Previously mentioned were the alleged payments to Jim White for fence construction at the Presbyterian Church. He and his wife, Lorraine (who is the 'heir apparent' as the new museum 'director'), both current HHS Board members, operate the Sugar Tree Country Store, a craft and gift shop conveniently located next to the “Historic Mansion House”, “purchased” by the Chamber/HHS with federal tax dollars, to be used as a “museum and interpretive/information center” for tourists. But the issue is not simply the relatively substantial amounts of public funds going into the pockets of local individuals. The issue is a widespread perception of secrecy, arrogance, and manipulation of a purposely misinformed public. A few privileged people, associated with 'non-profit' organizations, who claim to be working for the greater good of the county, are seen as benefiting personally at the expense of taxpayers and other sectors of the county economy. The Green Sheets state the Society bought the field to “preserve it” and that it was paid for by “155 documented donations from individuals, clubs and organizations, from 'McDowell Battlefield Heritage Days', the raffle of a doll, gifts from Civil War Reenactment groups and the Conservation Easement.” Since the HHS has refused to provide a detailed accounting, it is difficult to determine the extent of tax dollars vs. private dollars used for the 'purchase.' By 'reading between the lines', we were able to reach some approximate conclusions. The purchase price of the field was $99,500, less the $45,000 sale to the LaPrades, which left a principle balance of $54,500. The HHS borrowed funds from a local bank not to exceed “FIFTY-FIVE THOUSAND FIVE HUNDRED DOLLARS ($55,000.00)” (sic). In a December 17, 1999, article in The Recorder, Diane Klein reported the HHS had two years to pay off a debt of $55,000, and that $17,000 had been raised to purchase the field. The two-year period apparently ended May 17, 2001, possibly set out in the note or the original contract dated March 30, 1999 between the HHS and the Hogsheads. And no wonder she was confident, pleased and excited: What Mrs. Klein and The Recorder completely left out of the article was any reference to the $77,240 in federal ISTEA tax dollars The Highland Historical Society was expecting to be paid for the “Conservation Easement.” This funding was billed October 13, 2000 (approx. a month prior to The Recorder's article), by the Valley Conservation Council and approved by the Highland County Board of Supervisors. For billings between March 16, 1999, and June 13, 2001, the VCC was reimbursed $88,624.13 from federal ISTEA tax dollars for expenditures in connection with “Protection/Easement Acquisition Costs” related to the McDowell battlefield corridor. The $77,240 payment to the HHS was part of that amount. What happened to the $11,384.13 difference? The Valley Conservation Council charged the taxpayer for membership in the Highland County Chamber of Commerce. VCC charged the taxpayer for legal fees and even for interest on a loan from Planters Bank to cover an advance payment of $77,240 to the HHS (apparently a last-ditch effort to assure the HHS would have enough money to pay off their $55,000 bank note before the May, 2001 deadline). VCC charged taxpayers for a booth at the County Fair, for a booth at the Maple Festival and for a booth at Hands and Harvest Festival. County residents may remember the nice ladies from the VCC who sat in the booths and passed out literature promoting “conservation easements”, “protection” of the “Historic McDowell Battlefield” and the Rt.250 “corridor.” Their travel expenses and time (at $16-$22/hr.) were paid by the taxpayer. The Valley Conservation Council charged the taxpayer $1009.38 for participating expenses in the August, 1999, “Highland YTT Information Fair” (Highland Yesterday, Today and Tomorrow— organized by Diane Klein and the HHS as an event at “The Highland Center” where “agencies get together to plan the future” for the people of Highland. Their blatantly one-sided vision of the “future” centered on scenic byways, historic preservation, the McDowell battlefield, “conservation easements” and tourism). The VCC charged the taxpayer another $1,750 for participating in 1999 “McDowell Battlefield Days.” The VCC charged the taxpayer approx. $6,800 for producing a “Landowners Guide” to promote conservation easements and other control measures for private property. All of these expenditures were approved by the Highland County Board of Supervisors. $77,240 for a $51,500 Tract?! A value of $77,240 was placed on the conservation easement, which prohibited all future use of the property for anything not associated with historic preservation and conservation. Smith and Associates charged $2,600 for the appraisal. The appraisal fee was charged to the taxpayer, paid with ISTEA tax dollars and approved by the Highland Board of Supervisors. The latest county property reassessment, done in 1999-2000, placed an assessed value of $51,500 on the 25 acres, or half the Smith and Associates appraised M-1 value. The county appraisal report noted “historical value—civil war battleground” and also noted the conservation easement, obviously factors in assigning a lesser taxable value to land no longer able to be used for M-1 purposes. In the year 2000, The Highland Historical Society's tax return showed total revenue of $102,486— $86,240 coming from government grants and only $11,288 from “direct public support.” Fund balances at the beginning of 2000 were $25,008. The return shows a mortgage debt on the land purchase of $35,295 at the beginning of the year and no mortgage debt at the year's end. It appears the HHS used between $17,000- $20,000, from private contributions and find-raising events, to “purchase” the “river field.” The rest came from the $77,240 conservation easement payment— the taxpayer. In 2001, The Society claims to have “purchased” the home of James and Judy Ralston “for use as both a Highland museum and as an orientation/welcome center for the McDowell Battlefield.” “The Mansion House”, a historic brick home, c.1851, was originally built by George Washington Hull, a descendant of one of the early settlers of the county. In fact, the $135,000 used to purchase the home came from 1) Federal ISTEA grants of $94,170.48 routed through the Chamber of Commerce and 2) the remainder of Federal ISTEA funds from the $77,240 conservation easement. Both the Chamber and the Society are named as Grantees in the October 12, 2001 Deed, with the HHS having a 1/3 interest and the Chamber having a 2/3 interest. On December 21, 2001, the Chamber, by Deed of Gift, granted “their one-third interest” (sic) in the “Mansion House” to the Society. According to the recorded Deeds, it appears the Chamber still owns a 1/3 interest…! In truth, every penny of the purchase price, closing costs, recording taxes, research fees, survey, attorney fees and professional appraisal costs came from the pockets of taxpayers. Why the deception, secrecy, dishonesty and purposeful withholding of information? Why have a small group of 'insiders' and the local press kept the public misinformed, portrayed every event in the most glowing terms, pushed a minority agenda of 'tourism and historic preservation' on county residents while glorifying the entire process for the consumption of people from outside the county? These questions have been in the minds and on the lips of a great number of people , especially in the McDowell area, who have expressed puzzlement, disdain and disgust for the manner in which community members have been “used” and for the divisiveness created by the 'insiders' running the show. Several county residents, respected for their knowledge of county history and collections of artifacts, at first enthused about the prospects of a revitalized Historical Society and a bi-annual reenactment of the Battle of McDowell, have cut all connections with the event and the Society. One recently stated: “They won't get a damned thing I've got for that museum.” Some McDowell landowners, who once allowed reenactors to use private property during the weekend event, are no longer willing to do so. Some express outright hostility while others feel sadness and a sense of betrayal, yet retain hope the situation may someday be salvaged for the good of the community. Why has The Recorder presented a package of “baloney” to its readers? Are they purposely misleading their readers, not interested in printing the truth, incompetent or simply misled? There are many factors which might answer these and other questions: ignorance, ego, prestige, personal gain, greed, arrogance, misguided idealism, stupidity, a 'holier-than-thou' snobbery, lack of sensitivity by 'come-heres' for long-time residents, and a lack of understanding of the real history, tradition and rural culture of Highland. There is little doubt the obvious and glaring lack of private financial support and waning public tolerance for HHS actions are factors which have spawned a reliance on exaggeration, subterfuge and distortion.